First line: My career as a real estate salesperson was short and unofficial, but no uneventful. When we last left off with the Aurora Teagarden myseries, Roe had inherited a healthy chunk of money from a former member of the Real Murders Club that was prevalent in the first book in the series. At the end of book two, Roe had quit her job as a part time librarian and had begun to date the local Episcopalian priest, Aubrey. In this third book, Roe decides that she needs to find a job, if only to occupy her time during the day to evade boredom. 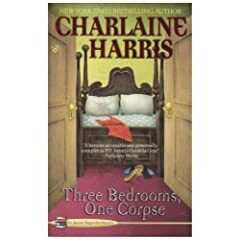 While unofficially showing a large mansion to one of the newest residents of Lawrenceton, Roe stumbles upon the dead body of a local realtor in one of the bedrooms. Soon after, there is a slightly murder spree targeting realtors, which Roe investigates, as well as starting a new relationship with the new man in town, Martin Bartell. For one thing, this book actually had plot and conflict. It was a delight to read, although Roe is starting to get pretty annoying. The constant references to her stunted height and frizzy hair appear on nearly every other page and it really detracts from the rest of the story. But, given that this is part of a mass-market paperback mystery series, I’m not expecting anything fancy. Its a fun read, especially when joining Roe in her conclusions and trying to figure out who the killer really is.